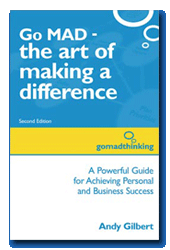 Finished reading Go MAD – The Art of Making A Difference by Andy Gilbert. Go Mad is an introduction to Andy Gilbert’s Go Mad framework. Gilbert describes each of the seven principles in-depth and relates them to practical real world examples. Go Mad contains lots of excellent information. If you’ve ever wondered why it is that some people seem to have the ability to make things happen this book will give you some insight. Gilbert’s writing style is the perfect match for this book. If you are looking for a little inspiration to get a project started or finished you will get it from this book.